Black Ops 4’s Blackout is a fantastic battle royale experience, but even the best game can be made better with the right updates. 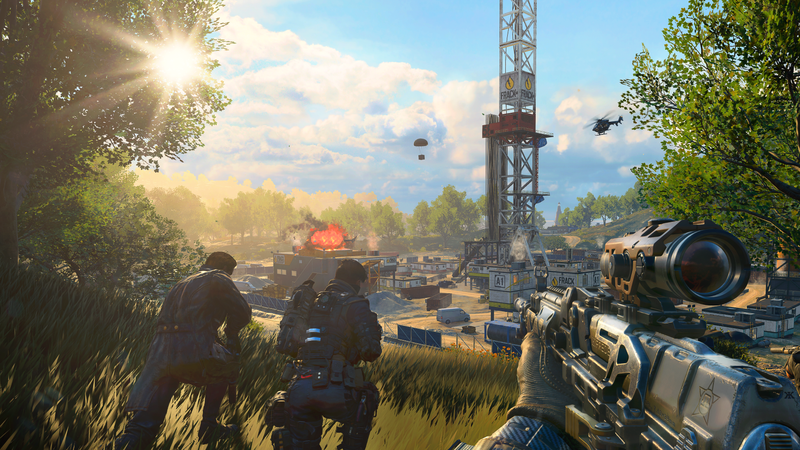 Treyarch design director David Vonderhaar has recently said that more changes are coming to Blackout. Since launch, we’ve seen stability updates and minor changes to improve the overall quality of Blackout. For instance, an update allowed you the option to press instead of hold the item pickup button for faster looting. That might seem like a small change, but it’s quite important when every second counts. The fight for a Blackout victory can often feel like a very sniper- or assault rifle-dominated experience, especially near the end of the match. However, there’s been a fair amount of weapon balancing to make other weapons more enticing to use. For example, the entire class of submachine guns received a decent buff. The bullet travel speed was increased to help make them more effective in long-range fights. Additionally, all the light machine guns were tuned to have less recoil, so you can feel like you have more options for securing that victory. The 9-Bang tactical was completely removed from Blackout for being an overpowered item. Use of the concussion equipment would leave you mostly blinded with just the silly animation of the character’s hand in front of their face as if they weren’t trained professionals. It was pretty easy to clutch a win if you had one equipped, and while I’ve credited some Blackout wins to use of the 9-Bang, I’m not too sorry to see it gone. If the tactical equipment returns in the future, I would hope it would be limited to a rare find in one of the airdrop crates. It makes players far too vulnerable to be so commonplace. All the Blackout character unlock missions have finally been added in, and their character-specific mission items now have a higher drop rate. The quests keep me dropping in hot locations, and I’m really enjoying the additional challenges with my quest to unlock all the characters. In my opinion, Blackout is the best battle royale for players wanting a less cartoony experience than Fortnite, but there are areas where the mode can still be improved. Treyarch has been really good about bringing updates to Black Ops 4, but what comes next for Blackout? Here’s what I’d like to see. Quicker item pickup is great, but navigating and arranging your Blackout inventory is still a pain. When I drop into a hotspot like Firing Range or Nuketown, I initially just pick up whatever is close by. Those first fleeting moments aren’t the time to be picky. I grab, go, and look to clear-out any nearby enemies. During this time, I’ve accumulated perks I might not actually want anymore or guns that I want to swap, while still keeping most of my weapon attachments. My stash of loot looks like chaos, and I have random bandages in multiple inventory slots. I can keep track of my gear better if all my stuff is organized, but doing it takes too long. I’m often the caboose of my four-person squad, trudging behind because I’ve taken too long sorting my inventory. An auto-sorting feature could make Blackout’s inventory less of a hassle if all of my goods could be stacked and sorted together by item type. Ammo doesn’t take up any of our precious inventory space, but it would save time during our chaotic looting adventures if there was an auto-pickup ammo feature like in Fortnite. There’s a limit to how much ammo you can hold, so quick bullet pickup shouldn’t really have any negative impact on the flow of the game. You still wouldn’t be able to run around vacuuming up the entire ammo supply of Rivertown to hinder your opponents. It would also be nice if we could have two primary weapons and a secondary slot for a launcher or knife. Occasionally, someone in my squad is so gung-ho about taking down a chopper, they’ll equip the Hellion Salvo launcher, but it’s rare that anyone is toting a rocket launcher in lieu of a second primary. Blackout looks and feels great to play, but there are some audio issues that can result in an untimely death. The sounds of footsteps and vehicles can still feel slightly off in terms of direction and distance. Even with a great headset, you might think the enemy perusing you on an ATV is off to your left, but they might actually be right behind you. Suddenly, you’re roadkill. David Vonderhaar has recently tweeted that plans are being made for upcoming audio improvements, so here’s hoping that future enemy footsteps and vehicles will sound more accurate as they approach. Prior to launch, Treyarch teased that Blackout would have an evolving map. Vonderhaar tweeted that map changes are happening, and that he’s played them, but no specific details or dates were given. Here’s to hoping we get more throwback locations like Hazard from Black Ops 1 or Standoff from Black Ops 2. In addition to Fortnite-style map changes, I also hope we’ll see more in-game challenges within Blackout. I’ve had a lot of fun scoring the hidden Dark Ops challenges and character skin unlocks, but eventually I’ll run out of additional quests. Nothing needs to be Epic Games’ style of funky with balloons or ghosts, but I’d like daily challenges to win, or to be tasked with getting X number of kills to earn extra Merits, skins, or loot. I’d love the option to earn some special Blackout camos. Blackout quickly became my favorite battle royale option because I love the nostalgic map, smooth gameplay, and Call of Duty style action without any wacky fortress building. However, I believe Blackout will need to stay fresh and keep evolving to keep much of the player base coming back for more.